The time has come around again when you’ll be thinking of a romantic gift for a loved one. Here at Experience Days we don’t offer the normal type of romantic gift… More like incredible spa experiences, driving gifts, quad biking experiences or even snorkelling with sharks. Don’t you think that would make it a Valentine's Day to remember? For our Valentine's Competition we're offering a wonderful Spa Pamper Session, located in the heart of Cape Town, for one lucky couple. You’ll get to enjoy a two-hour pampering session including a full body massage, a classic facial and a head massage for two. This romantic competition will end on the 13th February, with winners being announced at midday on the 14th February. Entrants must only comment their favourite romantic song on the Facebook post for their chance to win. 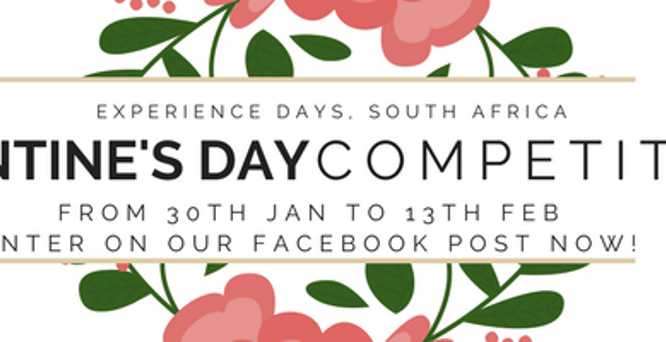 Experience Days team will judge all the entries that have commented only on the Facebook post and pick a winner. The winner will be announced at the times mentioned above. They will be informed from a Facebook Status and we will reply to their comment under the competition post. The prize being given away is one Rejuvenate Spa Day For Two in Cape Town experience. *This promotion is in no way sponsored, endorsed, administered by, or associated with, Facebook. The prize gift vouchers comply with Experience Days Terms & Conditions."